Welcome To Matthew’s Custom Calls, To Learn More About Us Hit The Below Button ! Visit Long Island Outdoorsman To Shop For Our Calls ! Click The Below Button To See Our Pro Staff & Calls In Action ! 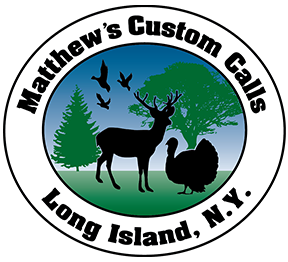 Welcome To Matthew’s Custom Calls Inc.
All of our game calls are made from the finest Acrylic, Laminated, Exotic and Hardwoods available; all of these products are handmade one at a time on a lathe with no duplicating tools, which means each item is ONE OF A KIND. We hand finish all of our products with a satin-gloss durable finish. All of our lanyards are made from 550 commerical type III 7-Strand paracord. All products are 100% made by hand and in the USA. Please use the toolbar atop the page to navigate the website & view all of our current items ! We primarily use eBay to sell our products. If the product you are looking for is NOT in stock in our store you can head over to the contact area of our website and there is a verity of ways to get in contact with us and we can custom make your order at ANY TIME. About Matthew’s Custom Calls Inc.
Hello, My name is, Matthew Wenzel. I am the owner and the craftsman of Matthew’s Custom Calls Inc. I have been a carpenter and woodworker for over 30 years mastering in the art of finish carpentry. I also have a wide range of experience in woodworking. For the past 6 years, I’ve been turning acrylic, laminated wood, exotic and hardwoods into game calls such as, turkey friction calls, strikers, duck calls, goose calls, deer grunt calls, predator calls, pens, bottle stoppers, & paracord products for my family, friends and hunting companions. I take the most pride in my craftsmanship to ensure you that you will be completely satisfied with your purchase at Matthew’s Custom Calls. At this current time we are not sponsoring any hunters or shows (whether on network home TV/internet TV/or both). We have been contractually bound to our current sponsored pro staff & we reserve the right to only sponsor them and not add any more sponsors at this time. Thank you for your understanding.